Studio strobe flash is a great artificial light source for those who need more light to adequately illuminate their subjects. Strobes also provide the photographer with a lot of flexibility, since they can be acquired in packages that include multiple lights. It's true that strobe flash is really more for professional studio photographers, but there are also plenty of amateur photographers out there who can leverage the power that a strobe flash provides. Despite the name, a studio is not required — you can set up one of these lights in the living room if you so desire. One of the main reasons that external flash units are so popular is because they are relatively inexpensive, provide great results and are immensely portable. If you want, the flash unit can go in your camera bag and travel everywhere your digital SLR goes. Strobe flash units are not so easy to tote around. They are bulky, heavy and - unlike a small external flash - require a light stand to sit on. A second issue with strobes is that they are really only useful for non-moving subjects, or subjects that move in predictable ways (i.e. runners going around a track). This is because once the strobe is set up on the stand, it's not all that mobile: you can easily move the position of the camera relative to the light, but moving the light is no easy task. Unlike an external flash attached to the camera's hot shoe, you can't run down the street lugging a digital SLR and a strobe. The flip side to all these limitations is a simple one: more power. Strobe flash units put out significantly more light than their external flash counterparts. 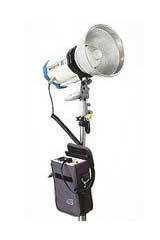 The large flash bulbs and the hefty flash casings are designed to blast your subject with light. The greater volume of light put out by a strobe means that you can use low ISO settings, reducing the noise and improving the quality of your images. Strobes are also compatible with a wide range of flash modifiers including umbrellas, soft boxes and barn doors (all of which help you get more professional-looking results from your flash photography. Given their size, bulk and cost, why would the average armchair photographer feel compelled to go out and get a strobe instead of a nice simple external flash unit? Notice that in both instances, I'm talking about your desire to take portraits. Action photographers aren't going to get a whole lot of use out of a strobe, and are better served by getting the more compact and portable external flash units. However, if you're tired of paying the high cost of the annual Christmas photo (and the kids are sick and tired of getting dressed up to go to the mall) then a strobe might be just what you need. Can you get the same results that they get in those commercial studios? I believe you can (the image below was taken in my living room). While it will take some time and practice for you to figure out how to place the strobe and adjust your camera settings, once you get everything in the right spot, the results that you can achieve with a good digital SLR and a strobe are equivalent (if not better) than what most mass-market studios can capture. The reason that you can often get better results with your own camera and strobe is because your subjects feel comfortable. Small children are significantly happier at home, and if it's Mom or Dad taking the photos rather than some complete stranger, they're often more likely to pose and behave for the entire photo session. As for the increased cost of a strobe: just consider how much you have to pay for prints at professional studios. Once you realize that there's no session fee, reduced printing fees (if you order online), and less headaches and family strife, a strobe flash can be an economical way of capturing those seasonal portraits that the grandparents love so much. Unlike all compact external flash units - where the power output of the flash is described by the guide number - the power of most strobes is listed in Watt Seconds (WS). Unfortunately, the use of Watt Seconds is even more muddled than the use of guide numbers for external flashes. Here's why: a Watt Second is NOT a measure of light output, it's a measure of electrical energy. The issue here is how efficiently that electrical energy is converted into light, and this particular task is left up to the flash bulb on the strobe. Let's say that you have two studio strobes from two different manufacturers and that one is listed as a 300 WS light, while the other is listed as 200 WS. Let's also say that the bulb on the 300WS light only coverts 50% of all that power to light, while the bulb on the 200WS light converts 80% of its power to light. Turns out the 200WS strobe puts out more light than the 300WS strobe. While this example is extreme - to make a point - it helps to clarify why Watt/Seconds can be an inaccurate measure of actual light output when comparing different studio strobes. 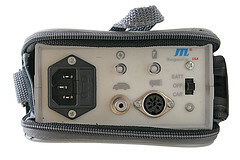 Many small external flash units run off the same basic power source: your standard AA battery. 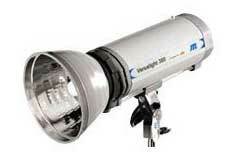 Since they put out more light, strobe flash units also need more power than 4 batteries can produce. There are two ways to get more power to your strobe: 1) Plug it into the wall with a power cord or 2) plug it into a rechargeable battery. The first option is by far the most economical, since the standard way to power most strobes is to plug them into a wall socket. There are no extra battery packs to purchase - all you need to get up and running is the strobe, a power cord, and an electrical outlet. But depending upon your shooting style and what you'd ultimately like to photograph with your strobe, this may not be the simplest solution. If you take your strobe on location where there are available sockets, you still need to find a way to plug the light in. Maybe the best location for the light won't be anywhere near a power source - in this case, the simple extension cord will be your best friend. Now the only issue is that you have a power cord stretched out across the floor - a great thing for everyone to trip over (depending upon the type of event you're trying to photograph). None of these power cord issues will affect you if you use a battery pack. You can set up the strobe anywhere you like whether there's available wall sockets or not. You can even take your strobe out into the middle of a field - if you so desire - and light up a subject in the great outdoors. And should your battery fail for some reason you can always resort to plugging the strobe into the wall (battery-powered strobes allow you to do both). The only drawback to the battery solution: rechargeable strobe batteries are incredibly expensive, and will add a lot to the price of the strobe. If you have the money to spend then I highly recommend a battery pack for its immense flexibility, but if you'd like to get up and running with strobe flash without cleaning out your bank account, then the powered option is the way to go.